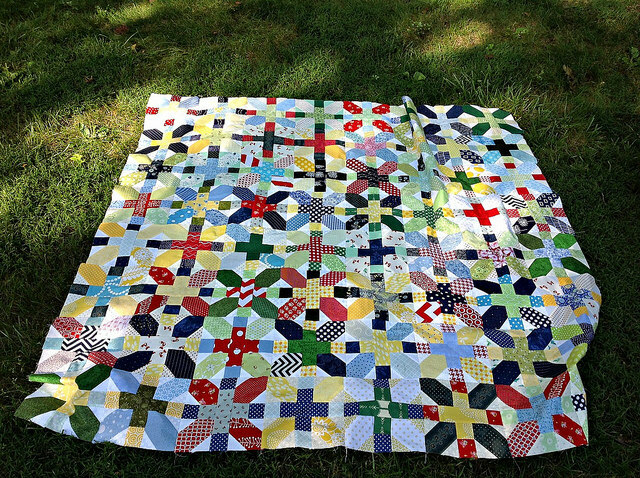 Friendship Swap for the Cross-X Block | OccasionalPiece--Quilt! ← Sew Together Bag, et al. 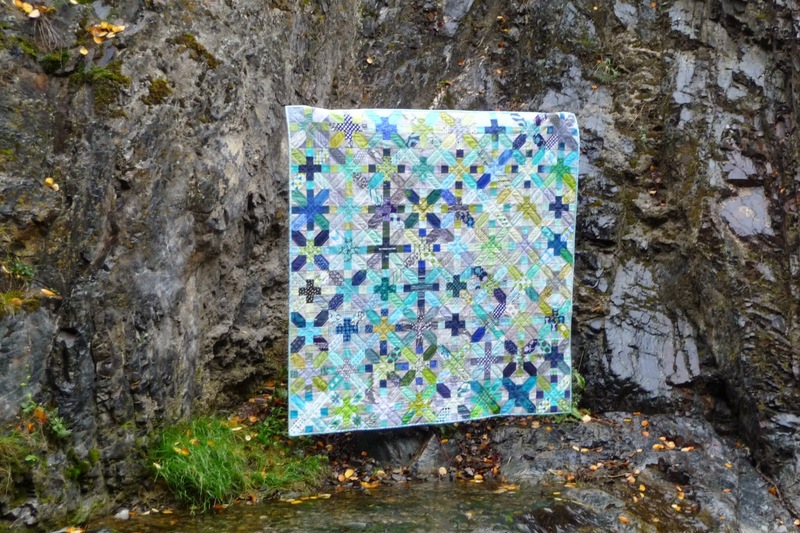 Posted on September 26, 2014 by Elizabeth E.
Today is the day we reveal our quilts made in the Friendship Swap of the Cross-X blocks (some call them the + and x blocks). I got started on this through an invitation from Krista of KristaStitched, who is now found more commonly on Instagram. She wrote and invited me to play along, and since I’d always wanted to try out this block, I agreed. Susan of PatchworkNPlay and Carla of Lollyquiltz set us up a Flickr Group and we were in business. I’m sure you remember these photos, as we kept track of our progress. Well, all of a sudden we were done, and then all of a sudden there was a deadline of today to get the quilt done. So, what you see up there is my quilt top (or flimsy), as the quilt is at the quilter, and since I was a bit slow in getting the top done, I don’t have the final “finish” on the quilt. Soon, very soon. However, I don’t think I have to worry about my partner Krista finishing her quilt top before I will. She was working on a better and bigger project, which arrived several weeks early! 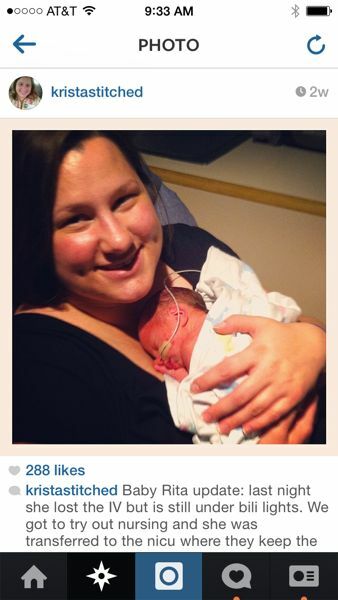 Congratulations, Krista! Having Baby Rita here safe and sound is waaaaay better than a quilt top. 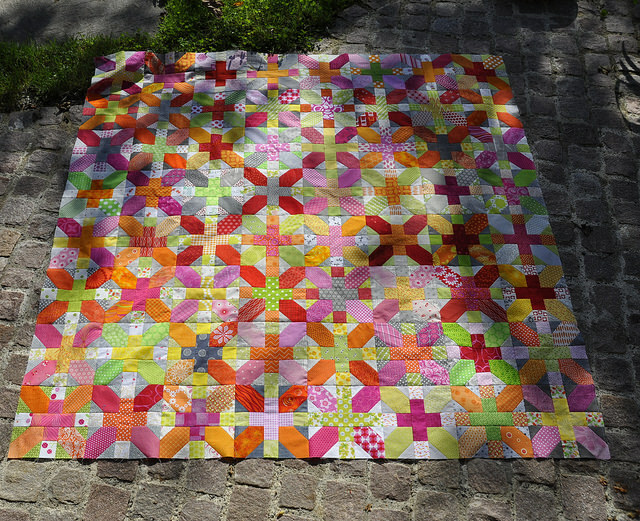 Many thanks to Krista, Carla and Susan, for inspiring us to a Cross-X quilt top. 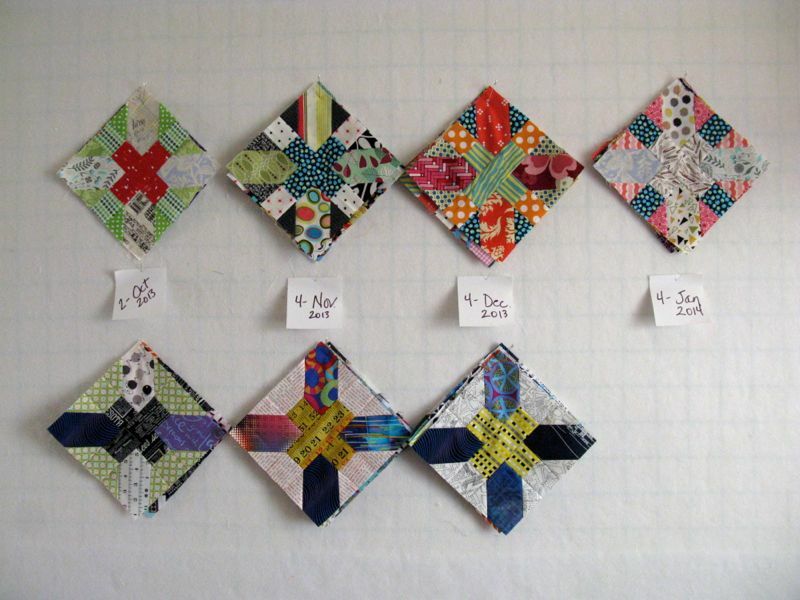 UPDATES: Here are some thumbnails of the completed quilts or quilt tops, with links to their blogs. Firstly, thanks for sharing this amazing journey with us! 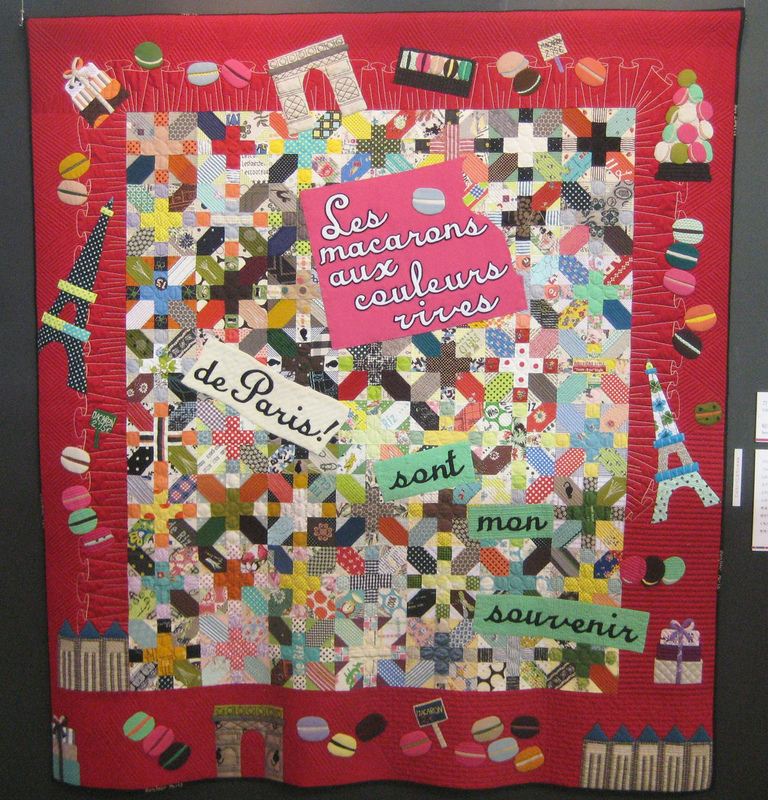 And I love that original quilt- so very French! Your yellow border is stunning- I look forward to seeing it in all it’s quilted glory soon! It looks wonderful. I LOVE the yellow border. Yes, I would say that Krista has more important things to work on right now. You cross x top is gorgeous- congratulations on a great finish! It’s great Elizabeth! Such a great example of scrappy and that border is perfect. The colors just sing together! Very uplifting. And how great that it was a work created by an ensemble of friends. H.
The orange outer border is great. These are looking so good. I love seeing how each one is the same only waaaaay different! 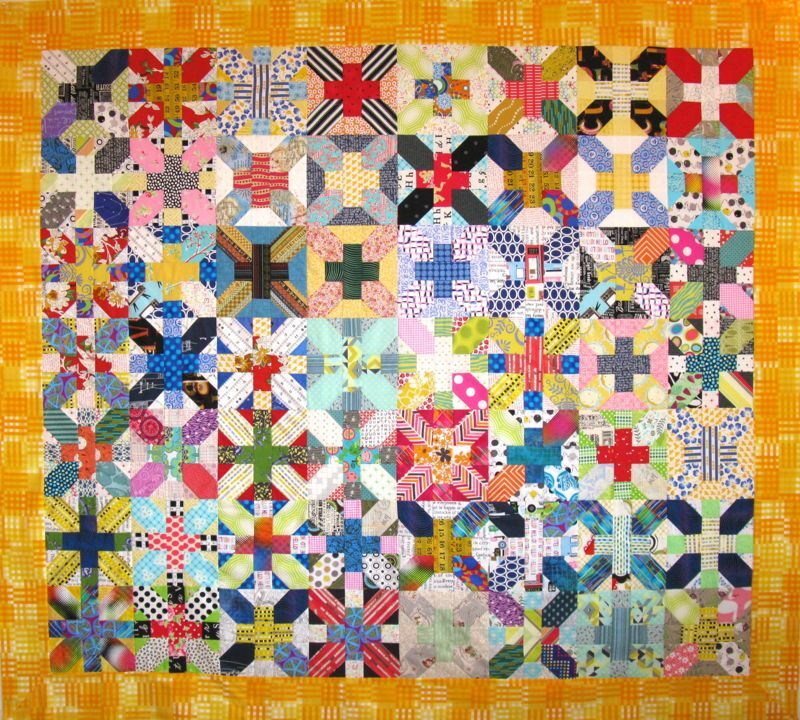 I really like your quilt and all the scrappiness of the blocks. Perfect for movie watching! That border totally makes the quilt. The squares are beautiful, and the border really makes them shine. Gorgeous quilt. 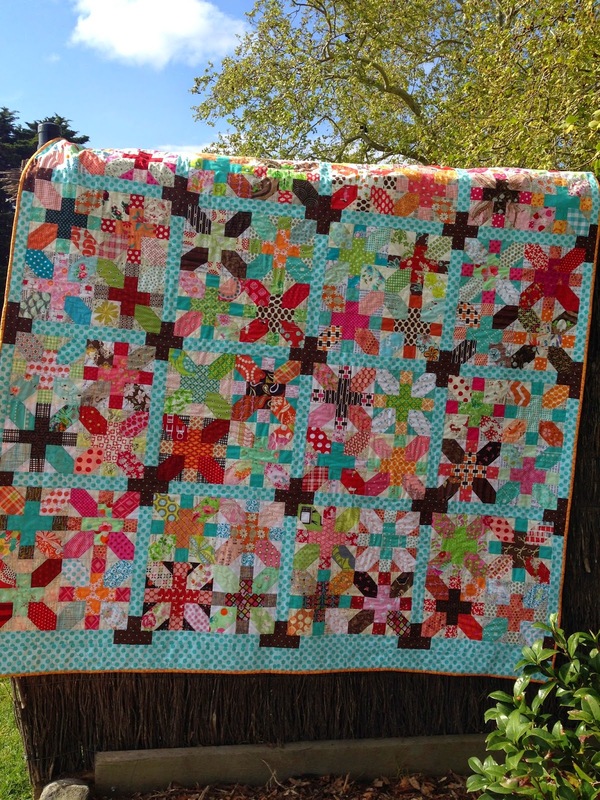 How great your colorful quilt looks, Elizabeth! Thanks for playing along. I saw Krista at KCMQG a few weeks ago and she looked great. I bet she will be back to quilting before you know it now that Rita has gotten to come home! What a great quilt and the border really makes it sing! 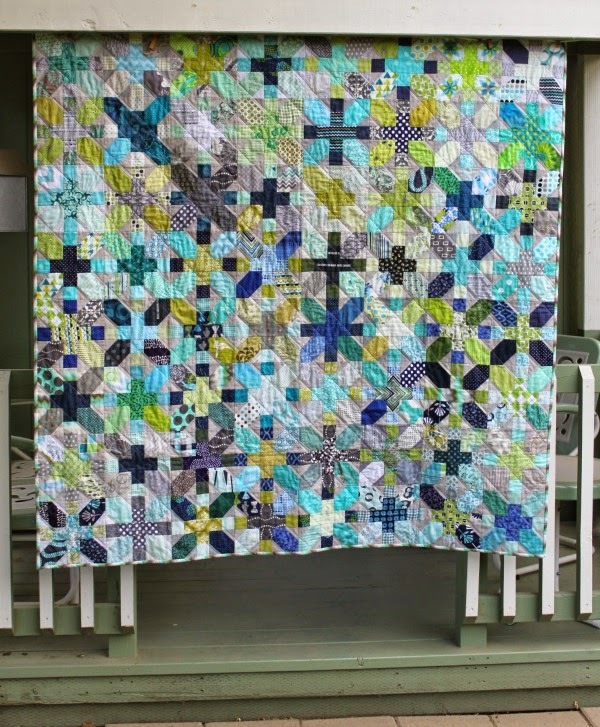 Wow, so many gorgeous quilts! Now I’m really sad I didn’t finish mine, haha. Owell, I guess Rita is keeping me pretty busy. Thanks for swapping with me, this was so fun. Thanks for sharing all the little thumb nail pics. You all made such great quilts and yet all so different. It’s a good block for showing off lots of variety.